Harold Camping proclaimed the Lord's return would be in 1994! Harold Camping now proclaims the Lord's return will be on May 21, 2011! Harold Camping teaches that the world will end in fiery destruction on October 21, 2011! Harold Camping (Family Radio) has aired Mormon advertisements! Harold Camping taught that NO ONE was saved between 1988 through 1994! Harold Camping teaches that the church age ended in 1994! Harold Camping teaches that the Holy Spirit is NO LONGER working in the church! Harold Camping teaches that EVERY church in the world is apostate! Clearly, Harold Camping is NOT a true Christian, and has fabricated his own cult. Please read, Religion: The Occult Connection. The Word of God must be our Final Authority, and not the traditions and lies of men. Photo to Left: Harold Camping, heretic and founder of Family Radio. In 1843, people sold their homes and businesses and went about the country preaching the imminent return of Christ. They were the followers of William Miller, a farmer and self-taught bible scholar from New York. Miller understood the 2300 days of Daniel 8:14 to refer to the number of years until the return of Christ. Though scholars for two millennia had been in nearly universal agreement that the prophecy referred to the time of Antiochus Epiphanies, Miller insisted it was for fulfillment in his day. In 168 BC, as Daniel had prophesied, the Seleucid king, Antiochus Epiphanies, entered Jerusalem to punish the Jews. As promised, he put an end to sacrifices at the temple, and he rededicated the temple to Zeus. He then offered Zeus the sacrifice of a pig upon the altar of God. Daniel 8:14 does not literally read "2300 days", but "2300 evenings and mornings." From the time of Antiochus entering Jerusalem until the temple was cleansed and proper sacrifices reinstituted was roughly 2300 days. The actual morning and evening sacrifices prevented totaled roughly 2300. Either reading finds fulfillment in real past history. William Miller believed the cleansing of the temple in Daniel 8 was not of a real temple, but rather referred to the purification of the earth by fire at the Second Coming of Christ. Because the "sevens" in Daniel 9 were translated "weeks" in the King James Bible, Miller assumed all prophecies referring to days must mean years. Adding 2300 years to the time of Daniel's prophecy gave Miller a date between March 21, 1843 and March 21, 1844. He began to teach this throughout the Northeast and gained a wide following. Despite the great excitement, March 21, 1844, came and went without the return of Christ. Miller was devastated, but one of his followers went back through the calculations and found what he believed to be the error. Miller's dating was based on the decree of Artaxerxes going out in early 457 BC, but the decree did not immediately go into effect, so the calculations were off. A new date was set of October 22, 1844. When even 1844 did not pan out, some of the followers abandoned the movement. Many however tried to find a new explanation. They were too embarrassed to admit their error. They had invested too much to be wrong. Ellen G. White eventually led the Seventh-Day Adventists to the conclusion that Jesus had returned invisibly in 1844, and that He would soon make His presence known. Another group that tried to hold to the 1844 date was led by Jonas Swendahl and was known as the Second Adventists. They believed that 1844 marked not the date of Jesus' return, but of the beginning of the last generation. Swendahl taught that Jesus would therefore return in 1874. One of Swendahl's followers was a former Presbyterian named Charles Taze Russell. When 1874 came and went, he concluded 30 years was not long enough for a generation. So he added 70 years to 1844 and concluded that Jesus would return in 1914. This and other differences led him to split from the Second Adventists and launch Zion's Watchtower and Herald of Christ's Presence. His followers became known as the International Bible Students, and they went about the country with the message, "Millions now living will never die!" Followers were to leave their churches and fellowship together. All churches were considered apostate, but God had provided a new channel for their instruction, Zion's Watchtower Tract Society. What began as the International Bible Students has become the Jehovah's Witnesses. The date of 1914 was changed to 1925, 1941, and 1975. What began as calling Christians out of their churches to prepare for Christ's return has become an anti-Christian cult. I believe we are seeing something similar attempted today. In 1992, Harold Camping published 1994?. Like Miller, he rejected the historic understanding of Daniel 8. The prophecy clearly describes the rise of the kingdom of Greece under Alexander the Great, and the division of his empire among four others. But instead of seeing the prophecy as fulfilled then, Camping transports its fulfillment to our own day. Like the Adventists and the Jehovah's Witnesses, he focuses on the "hidden" meanings of texts, seeing pointers towards 1994 in the number of swine drowned in the Sea of Galilee or in the number of servants in Abraham's house. Camping introduced 1994? 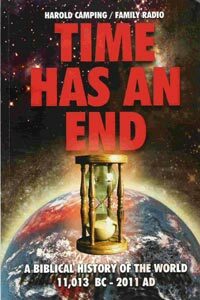 with the following statement, "No book ever written is as audacious or bold as one that claims to predict the timing of the end of the world, and that is precisely what this book presumes to do." As audacious as it was, it was wrong. September 6, 1994 came and went. Camping seemed to back away from his false prophecy, but he has now decided he was right all along. It was too bitter a pill to swallow to be wrong. Like the Jehovah's Witnesses, he says 1994 wasn't the wrong date. We just have to add 7 years to it. Like Russell he is now telling Christians to leave their churches. All are apostate. You should no longer trust your pastors and elders, but you should abandon them and turn to one of the only true channels of God's Word, Family Radio. Like Jehovah's Witnesses, you should simply fellowship together and await Word from Oakland. Photo to Right: Harold Camping is now claiming the end of the world on October 20th, 2011! In these new fellowships, there is to be no discipline, no baptism, no communion, and no authority apart from Family Radio's interpretation of the Bible. Mr. Camping rejects 1 Corinthians 11:26 that says we are to proclaim the Lord's death, till He comes. He rejects the clear teaching that the gates of Hades will not prevail against His church (Matthew 16:18). With even greater certainty than he had in 1994, Mr. Camping now says abandon the elders who provide watch over your soul (Hebrews 13:17), who are to shepherd the flock (1 Peter 5:1-3), and feed them (Acts 20:17-28). Do we no longer need shepherds other than Mr. Camping? Do we no longer need men to watch for our souls? Do we no longer need to be reconciled to brothers (Matthew 18)? If we do, what church is to judge it? Is Mr. Camping our pope who will judge for us? Family Radio may not be the Watchtower Tract and Bible Society, but it is built on the same wrong-headed interpretations of Scripture, the same date-setting, the same recalculations, the same accusations of complete apostasy, and the same claim to be the last true channel of God's Word. Despite the differences, both are heresy - - the tearing apart of Christ's church. We do live in a day of great apostasy. Churches do more often than not resemble circuses and stage shows, but the church has always had these troubles. The church has also had predators who point out these problems to get you to follow them. The Jehovah's Witnesses point out the pagan origins of Christmas and Easter celebrations, but only to lead you into some greater error. Now is the time for faithfulness, not just another form of apostasy. Like the Jehovah's Witnesses, Mr. Camping accuses anyone who differs with him of not really believing the Bible and accuses them of being idolatrous of their church. The true idol here is Mr. Camping. Will Christians read the Bible for themselves and search the Scriptures to know if these things are true, or will they blindly follow Mr. Camping into yet another false prophecy? And what will be the result for them if they do? The following are some examples of the wildly speculative exegesis of Harold Camping. All the references are from The End of the Church Age … and After. Beware of such a "Bible teacher." Notice his many assertions, none of which he proves from the context or from the language of the text itself. (1) The star in Revelation 9:1-3 is the Lord Jesus Christ (pp. 8, 86). (2) The three and a half years of famine in the days of Elijah typify the three and half years of Christ’s earthly ministry (p. 22). (3) Isaiah 5 "is speaking about the kingdom of God as it was represented by the local congregations throughout the church age" (pp. 24, 29). (4) "We may safely equate the stinking fruit of the church age with the high places of Old Testament Israel" (p. 29). (5) "We know that the two witnesses (of Rev. 11) represent the true believers who are driven out of the churches or in obedience to God’s command come out of the churches" (pp. 32-33). (6) "The beast and the false prophet are pictures of Satan as he ruled in the churches during the Great Tribulation" (p. 41). (7) "The rider on the black horse (Rev. 6) is a warning to the churches that if they do not remain faithful God will begin to take the Gospel away from them" (p. 42). (8) In Revelation 12:7-11, "Michael is the Lord Jesus Christ" (p. 56). (9) "The wood, hay and stubble (of I Cor. 3:12) must relate to the church members who are still unsaved" (p. 64). (11) "The image of Satan (Rev. 13:15) consists of the unsaved within the churches" (p. 97). (12) The merchant in the parable of the pearl (Matt. 13:45-46) "can only be Christ. The pearl is the kingdom of God. Christ sold all that He had, that is, He emptied himself of His glory and became the suffering servant in order to obtain the kingdom of God" (p. 100). (13) The woman in Proverbs 31 is a "picture of the believers as we buy without money the Gospel and sell it to others who buy from us without money" (p. 101). (14) The corn and wine after which the children pine in Lamentations 2:11-12 are "words pointing to the Gospel" (p. 108). (16) "Causing someone to fall backward is equivalent to calling down fire from heaven" (p. 181). (17) "The application (of Jeremiah 7:16) is that God is commanding us not even to pray for the churches" (p. 197). (18) "This prophecy (of Ezekiel 9:5-7) can relate only to the judgment on the churches during the Great Tribulation" (p. 197). (19) "The abomination of desolation (Matt. 24:15-16) is Satan" (p. 210). (20) "The housetop (Luke 12:3) is identified with bringing the Gospel … the house identifies with the church" (p. 229). (21) "Paul (in Acts 28) is a picture of all who have been cast out of the churches and congregations. In this chapter, as in chapters 22-27 of the book of Acts, the churches and congregations are typified by the Jews who do not want to hear the whole counsel of God" (p. 231). (22) "This half hour (Rev. 8:1) must be understood to be the first part of the Great Tribulation during which heaven is not saving people by means of the Gospel going forth from the churches" (p. 249). (23) "The seven women mentioned (in Isaiah 4:1) identify with the seven churches of Revelation 2 and 3 … In Isaiah 4:1, they are presented as those who take hold of a man, that is they want the Son of man, Christ, to be their Savior and King. But they don’t want Him to be their spiritual bread, and they don’t want to be clothed with His robe of righteousness. They want their own bread and their own clothing, that is, they want the name of Christ; they want to identify with Christ, but they want their own salvation program. In other words, they want to be the final authority as to truth. They do not want to be that concerned about the truth of the Bible … however, verse 2 of Isaiah 4 reveals that in that day, the day when this sorrowful condition exists in the churches, the branch of the Lord (Christ) shall be beautiful and the fruit of the earth (those who are becoming saved) will be excellent. They are the ones who are being saved because there were those who have escaped from the church or congregation and continued to bring the true Gospel outside of the church" (p. 257). (24) "The keys (Matt. 16:19) can only be the Bible" (p. 273). (25) "A careful study of this chapter (Eze. 28) would show that78 Tyre is representing the churches as they send the Gospel into the world" (p. 286). (26) In Revelation 12 "the woman is the Old Testament believers represented by Mary, who gave birth to Jesus. They are clothed with the sun, that is they are clothed with Christ who is their robe of righteousness. The moon is under her feet. The moon represents the law of God. The believers have become victorious over the law in the sense that the law of God can no longer condemn them. The crown of stars signifies that the believers reign with Christ" (p. 290). (27) When the dragon drew the third part of the stars of heaven and cast them to the earth (Rev. 12:3-4) "this third part represents all who are believers" (p. 290). (28) "When Jesus entered Jerusalem just before He was crucified, He sat on a pair of donkeys. Spiritually, it can be shown that79 these donkeys represent unsaved people he came to save" (p. 298). (29) The merchants of the earth (Rev. 18:11) represent believers in the churches who were bringing the Gospel but may no longer do so during the Great Tribulation (p. 311). The most damning of Mr. Camping's listed teachings is that "Michael is the Lord Jesus Christ" (The End of the Church Age … and After, p. 56). Harold Camping is a Jehovah's Witness in doctrine. To deny that Jesus Christ came to earth as the Godhead incarnate is blasphemy against God. Colossians 2:9 in the trustworthy King James Bible states... "For in him dwelleth all the fulness of the Godhead bodily." John 1:1-3,14 clearly evidences the deity of the Lord Jesus Christ, and again in John 10:33 when Jesus Himself claimed to be God. In Revelation 1:8 Jesus claimed to be "the Almighty!" There is NO heresy in the Bible about Michael, the archangel, becoming flesh and dying for men's sins. Harold Camping is a Modernist, an imposter who knows not the God of the Bible. Mr. Camping's ministry is of the Devil.